I once got into an email discussion with an engineering director a couple of levels above me about a concern I had with engineering’s decision to use interchangeable brand names for two different types of microprocessors. He challenged my assertion that co-mingling the brand names would confuse customers; he was of the opinion that it didn’t matter. I and my team were putting the finishing touches on the complex microprocessor documentation for one of the microprocessor families and I argued that we needed to resolve this branding issue before finalizing the many documents and thousands of pages of information. When pushed, I pushed right back. I stated that Brand X microprocessors already had an established positive market identity and tossing in a new type of microprocessor (that did different things from those identified with Brand X) would not only NOT extend the brand identity and preference for Brand X, but dilute the progress that Brand X had already made in the market. The features and benefits of the new product were different from those of Brand X and it would be a huge marketing mistake to feed the new and different product line into the existing established one. I cited research that showed that leveraging brand equity of a successful brand (Brand X) would make the introduction of a new Brand X product entry less costly; but to toss in a new Brand Y product entry into the existing Brand X product stream would be a bad decision. Throughout this back-and-forth email debate, we copied all the marketing directors…and not ONE of them joined in the discussion. The silence was, in fact, deafening. Building brand equity is an investment, and studies of consumer brands in different markets found that successful brand extensions spent less on promoting extensions because of the intangible “good will” built up with the parent product. For example, Coca-Cola introduced six brand extensions that captured a larger market share than the original brand; Cherry Coke, one of the extensions, was hugely successful despite a near-zero advertising budget. And with that final retort, I thought that maybe I had better find some empty boxes and start cleaning out my office ahead of the HR Grim Reaper. I had tugged on Superman’s cape; I had peaked under the mask of the Lone Ranger. Long story short, I kept my job without any negative repercussions, the product line was merged with Brand X (much easier to keep your job at the executive level to agree with a wrong decision than for someone to say a decision may be a wrong one), and shortly thereafter, the engineering director resigned to “pursue other career opportunities.” In the high-tech world, that’s usually a euphemism for getting fired or being asked to resign. Did our disagreement have anything to do with it? I doubt it; but it had me thinking about this individual’s knowledge of creating brand identity and building brand equity (in fact, why was an engineering director controlling branding discussions when it was really marketing’s job?). Why was he pushing back on what I thought were sensible, research-backed ideas. From what I later heard, this engineering director lacked certain relationship-building skills up the corporate ladder. Yes, he stepped outside of his domain expertise (engineering) by insisting the two brands be combined and that there would be no downstream (i.e., customer) issues–even when presented with a rational, logical argument for keeping the brands separated and understanding how the brand equity is determined (partly in the stock price). His disregard for wise council from others–and how he responded to suggestions–ultimatly led to his exiting the company. There’s a lesson to be learned here. You may possess all the technical or professional skills necessary to do your job, but what really propels you upward and forward in your career are your verbal and written communications skills–including your ability to evaluate your own self-talk–to know your domain of expertise and to know when you’re out of your league– and your ability to nurture relationships up AND down the organization ladder. Not all professional credentials are created equal. Credentials are vital to professionals seeking to change careers or advance within their own. But the extent of credential value and use varies from one industry to the next, so it is important to understand exactly how a professional designation/ credential can best serve your career aspirations. Many professional credentials are awarded after rigorous exams and verified experience—some may require degreed standing as well. They attest to the knowledge and expertise of the credential holder. Many designations are highly regarded and valued within the profession they serve. However, you cannot expect a designation after your name to help if you want to transition to a field outside of the one for which the credential serves. The proper credentials can make it easier to climb the corporate ladder with your current employer or help push open doors a little wider to those professions that may lie on the periphery of your functional expertise. When I worked as a geologist/geophysicist from 1980-1985 with Phillips Petroleum, part of my unofficial responsibilities was to also serve as the division’s editor for all technical papers being forwarded to journals or conferences. I was also part of the first group of geologists to become certified on Intergraph digital workstations that were used for oil and gas exploration mapping. The week-long class paid off when I got laid off from my last oil company job in 1986. Nine months later I got a job as a technical writer/editor for a company that developed geological mapping software—for use on Intergraph digital workstations and other large computers. You can see the peripheral relationship between the two jobs/careers that the certification helped bridge. That résumé at the time focused more on my technical and computer skills than my geology/ geophysics skills and experience because those where the skills that had the best chance of being transferred to a tangential field. And that is the key to using certifications or licenses when changing careers. 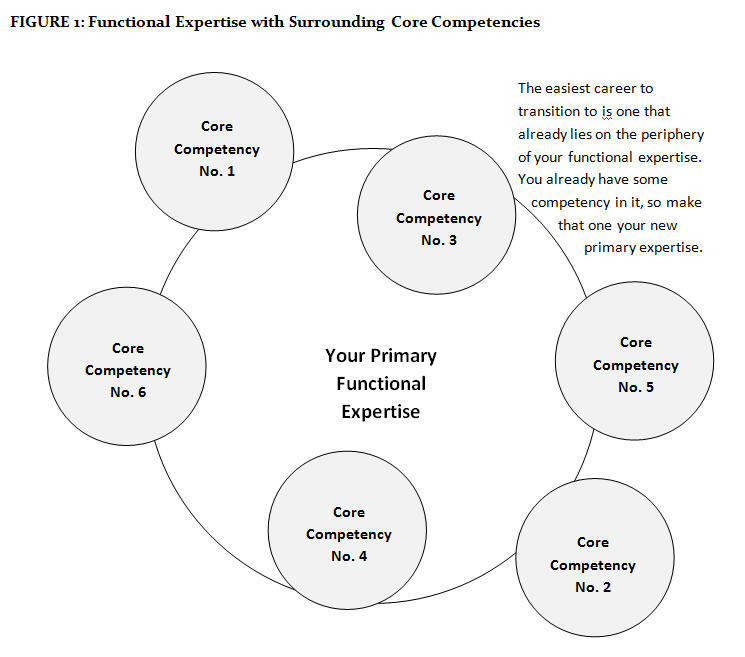 Imagine that your functional expertise is a large circle, and all the ancillary skills, knowledge, and expertise (called core competencies) are smaller circles overlapping all around the edge of the larger circle (Figure 1). Some circles have a larger overlap than others, depending on the strength of the expertise in those peripheral areas. Career changes are easiest to manage when the transition is from an existing functional expertise to one of the overlapping core competencies. In time, that core competency becomes the new functional expertise. Many credentials can be very beneficial for such related career transitions. Career changes are far more difficult when trying to move from one functional expertise to another—jumping from one large circle to another that has very little or no overlap. Usually, such career changes involve additional education (college degrees, other certifications and licenses, etc.) not to mention some experience in that field. Be mindful that many recent college graduates (RCGs) are entering the workforce already armed with bleeding-edge knowledge and the latest skills. With mid-career changers and college graduates competing for the same positions, lower compensation requirements for RCGs will in many instances drive the decision as to who gets hired. If you have many valid and relevant professional designations, select just the ones that best support your expertise for the position(s) to which you are applying. Hiring managers are most interested in only those certifications and licenses you actually possess, and not all the coursework you took along the way or what you hope to complete in the near future. In some instances, candidates use this approach to disguise the fact that they may not have the requisite educational requirements. Hiring managers are wise to this ploy. If you work in the public sector and have a long list of certifications or designations obtained through government training and testing, keep them in a separate document that can be used as part of your documentation portfolio. Place just those certifications that are relevant to the position on your résumé. I wrote in Confessions of a Hiring Manager Rev. 2.0 (Second Edition) that the most recent recession has created another “time of parenthesis” as John Naisbitt called the 1980s in Megatrends. The education system must respond by preparing individuals to help shepherd business and technology processes in mature and emerging economies over the coming decade. Online colleges, business and trade schools, community colleges, and certifying organizations must step up to meet the demand for qualified professionals to address the challenges and opportunities the world economy will face. Ensure that the credentials you pursue are highly respected, convey trust, integrity, and expertise for all who possess it, and confidence for all who call upon it when needed.